At Halton Exteriors, all of our workers are WSIB trained and fully insured. Many have been working with us for a long period of time. We focus on details and it shows when you read the reviews available on HomeStars. We have a 10 star rating because we make sure you are happy with our services before we consider the job done. To read more about each of our services, please click on the service below. If you have any questions, or would like a Free Estimate, please call us at 289-772-7908. Eavestrough, also referred to as rain gutters, trough or gutters. The eavestrough collects roof rainwater funneling it into a downspout which then diverts the water away from the structure. It is crucial in avoiding saturation of rain water against the foundation of your home. 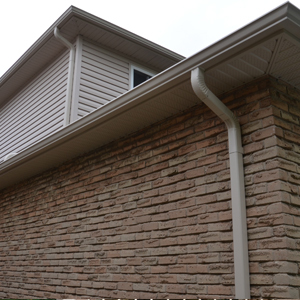 We install both 5” and 6” seamless gutter with either large square 3” x 3” or jumbo 3” x 4” pipe. We miter our corners and secure downpipes to the wall with screws and plugs not nails. A wide variety of colours are available for matching your existing soffit and fascia if only replacing gutters. Eavestrough also referred to as rain gutters, trough or gutters. The eavestrough, collects roof rainwater funneling it into a downspout which then diverts the water away from the structure. It is crucial in avoiding saturation of rain water against the foundation of your home. 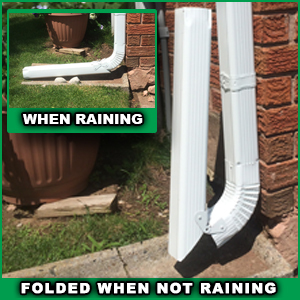 We install both 5” and 6” seamless gutter with either large square 3” x 3” or jumbo 3” x 4” pipe. 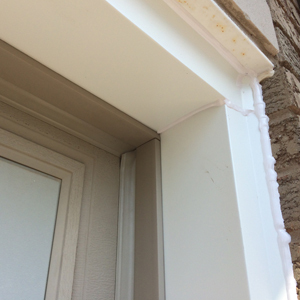 We miter our corners and secure downpipes to the wall with screws and plugs not nails. A wide variety of colours are available for matching your existing soffit and fascia if only replacing gutters. We use exclusively Alu-Rex products. We’ve assessed all other leaf guard protection products on the market and feel Alu-Rex is the best for both function and price. When installing new gutters we use the “T-Rex” continuous hanger system which not only keeps debris out of the gutters but adds unsurpassed strength and durability to your newly installed gutters and prevents snow and ice build in your gutters in the winter months. If you just require leaf protection and don’t require new gutter. 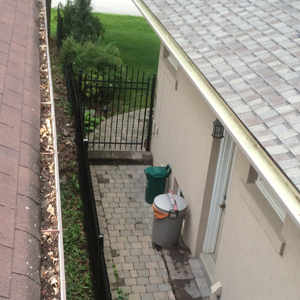 We install the “Gutter Clean” system over your existing 5” Eavestrough. 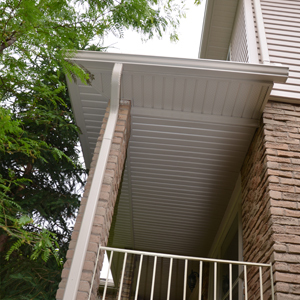 The soffit is the exposed undersurface of any exterior overhanging section of roof eaves. In addition to roof vents, your homes soffit plays a crucial role in the elimination of very hot stale air in summer and warmer humid air in winter from your attic space. Cooler air is drawn in through the soffit and exhausted out through the roof vents. We use vented soffit panels on all eaves and gables and non vented panels on porch ceilings. A wide variety of colours are available. Fascia is the horizontal band which caps the end of the rafters on the exterior of a building. Also the facing below the edge of the roof on gables which is also referred to as bargeboard. Cladding fascia board in aluminum protects the wood from rotting over time, making it maintenance free. A wide variety of colours are available. If your home is of an older vintage with wood framed window and doors, capping the older weathered wood in aluminum doesn’t only add great curb appeal but makes maintenance a thing of the past. No more scraping and painting. A wide variety of colours are available to match your current colour theme. We also offer custom aluminum work. If your home is of an older vintage with wood framed window and doors, caping the older weathered wood in aluminum doesn’t only add great curb appeal but makes maintenance a thing of the past. No more scrapping and painting. A wide variety of colours are available to match your current colour theme. We also offer custom aluminum work. Whether providing support or just for decorative purpose the wooden columns used extensively in newer subdivisions just do not stand the test of time. We replace these wood columns with fiberglass columns for support or PVC for wrap around applications where a metal post is already installed. Both are impervious to moisture and insect infestation. Bases and caps are made from high quality rigid polyurethane foam which is virtually maintenance free. We supply and install a finished product. Sanded, washed, primed, caulked and painted using high quality exterior products. 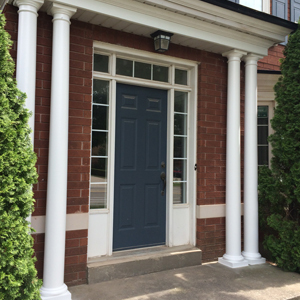 Columns are available in round or round tapered, smooth or fluted. Square columns are available smooth, fluted or with recessed panels as well as tapered. We clean up the work site and take away old columns for disposal. The most important decision you make when it comes to your homes exterior is the roofing system you choose. A Halton Exteriors roof consists of metal drip edge on eaves, ice + water shield on all eaves minimum 3’ plus in valleys around chimney and skylights and metal valleys. Steel roof vents (not plastic or tin), proper bathroom exhaust vents with flappers. The entire roof deck is covered with synthetic underlayment, then a quality fiberglass laminate shingle is installed properly (no racking). We recommend the CertainTeed Landmark or even better the Landmark Pro. Owens Corning Duration Shingle is also a good choice especially in high wind applications. 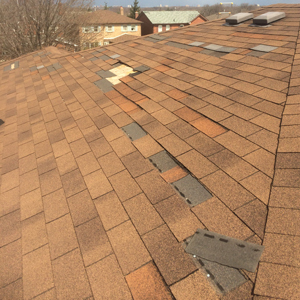 The cleanliness of the homeowner’s property is just as much a priority as how well the roof is installed. 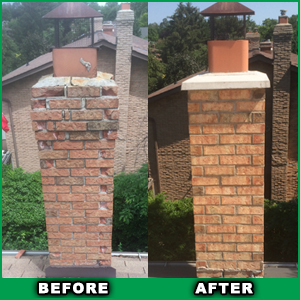 Usually caused by a crack or absence of a concrete chimney cap, water can migrate along the mortar joints of the brick below especially in the winter months during a thaw. When temperature goes below freezing there is expansion which causes the mortar to crack, as this worsens, water starts to migrate inside the brick and then the actual bricks will crack or spall. Damage caught early and installing a new concrete chimney cap will prevent further damage. Left as is the cracking and spalling starts to travel down the chimney to the roof line or even below. A lot of homes were constructed using bricks as window sills. When water migrates down through the mortar joints and freezes in the winter months, step cracks and eventually spalling occurs. 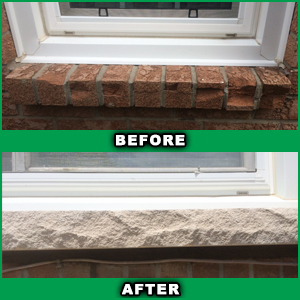 Instead of fixing the brick sills, we recommend replacing the brick with new one piece limestone sills. The current building code for attic insulation is R50 and is soon to be R60. If your home is more than 30 years old you many only have R12 to R20. If you can see the ceiling joists when you peak inside your attic, you don’t really have enough insulation to prevent warmer humid air from entering the attic space, which is the main cause of ice damming on your eaves in the winter. To function properly your attic space needs 3 things, proper soffit ventilation, proper roof ventilation and enough insulation to keep the ambient temperature in your attic pretty much the same as the outside temperature. In addition there needs to be baffles installed to allow the soffit air flow to enter the attic space unobstructed, weather stripping around the hatch door and the hatch door needs to be insulated as well all bathroom exhaust vent pipes need to be insulated. 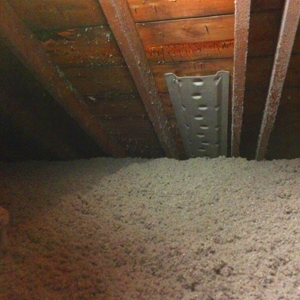 We use cellulose insulation over fiberglass blown in for a few reasons. Firstly it is denser than fiberglass which means it works better as an air barrier. It’s a green product made from recycled paper and because it’s treated with boric acid to deter insects and such. It is also treated with a fire retardant and is mold resistant. Call us for a free assessment. 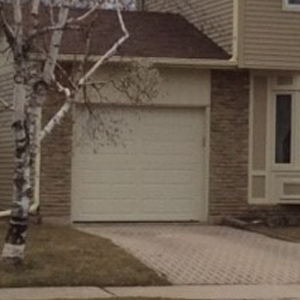 Garage doors have come a long way from the old metal sheets we used to know. Many new technological break throughs have led to the solutions put into every one of our new garage doors. Garage doors go through more than one realizes, and this short video highlights problems that have been faced in the past, and how we go above and beyond to offer you the best product. A Zip Hinge is another little extra our clients found useful. This hinge allows for the downspout that is in the way to be moved up easily taking it out of the way. For example moving it up off the grass for mowing the lawn. Sometimes downspouts have no choice but to be installed on a walkway. This hinge allows it to be lifted out of the way. Ask us about your needs and we may be able to help.